Empirical studies routinely find that value stocks, defined as those with high book values compared to market value, outperform growth stocks with high market values relative to book value. Though this may seem odd at first blush because rapidly growing companies have more opportunities and value companies are more often distressed. However, after taking account of market pricing, the average returns on value stocks historically have exceeded those on growth stocks. A good way to illustrate the value effect is making use of data compiled by Professors Eugene Fama and Kenneth French and posted on Professor French’s website. The particular variable of interest is the portfolio HML which is long value stocks and short growth stocks. (HML stands for high book to market minus low book to market. Professor French provides a description of how HML is constructed and the returns are calculated on his website.) To the extent that value stocks outperform growth stocks, the return on HML will be positive. The exhibit below plots the rolling five-year average return on HML over the 92-year period from January 1926 through July of 2018. (The first five-year average is for 1931.) The average is used to eliminate some of the volatility in the monthly series. The horizontal red line shows the average return is 4.48% over the full 92-year period – evidence of a pronounced value effect! But here a critical caveat raises its head, a caveat that we stressed in our book, Conceptual Foundations of Investing, and in various posts and videos. The potential problem is non-stationarity. The issue of non-stationarity is sufficiently important that it is worth reviewing with a simple example. Consider a jug containing red, white and blue balls. The jug is shaken up, a ball is drawn at random, and its color noted. Then the ball is put back in the jug and the process is repeated. Though it is unknown at any step what color ball will be drawn, the probability of drawing a red, white or blue ball remains unchanged. There is no distinction between the first draw and the tenth draw or twentieth draw. Each replication of the experiment is identical. That is what is meant by a stationary process.Now, suppose that in the middle of the experiment new balls, perhaps even of different colors, are added to the jug. This changes the random process so that past data are no longer predictive of the future probabilities. The change in the process is an example of non-stationarity. In the case of common stocks, their monthly returns can be thought of as draws from a probability distribution with a given mean and variance. The mean of the process represents the expected return on the stock. A critical question for investors is whether that process is stationary. That is whether the mean, the expected return, is unchanging. This turns out to be a particularly difficult question to answer because stock returns, even five-year average of stock returns, are so variable. For instance, take a look back at the exhibit. The five-year average return of HML ending in 2006 was over 15%, whereas the five-year average ending in 2011 was less than -5%. Was this difference just due to random variation or was the process non-stationary in that the expected return had declined? The question is critical for investors because the five-year average through June of 2018 is -2.8%, close to an all-time low. Is this because the last five years have been a negative random blip or because the value effect has disappeared? 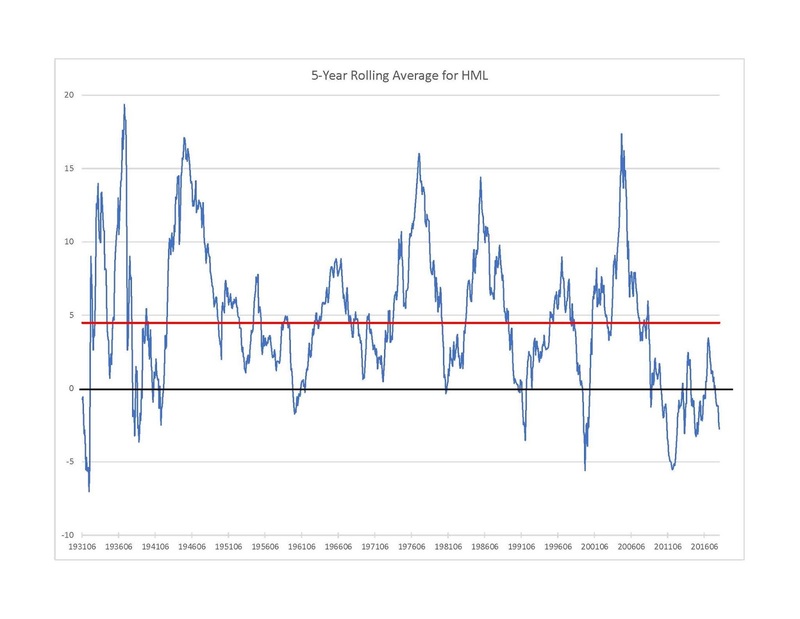 The view that the expected return has declined is reinforced by the fact that the five-year average value premium has been below its long run average ever since the end of the financial crisis and below zero much of the time. Such an extended period below zero is unprecedented and is the reason why prominent value investors such as David Einhorn of Greenlight Capital have suffered in recent years. But given the immense volatility of HML, as evidenced by the large spikes and sharp drops, it remains possible that the current poor relative performance of value stocks is a random fluctuation and the value premium is alive and well. Each investor will have to make his or her own decision. All we can say for sure is that the problem of non-stationarity is far too important to be ignored.